Christmas is only a couple day away and New Year’s Eve is right around the corner which means it’s time to bring out my stretchy pants because over the next week it’s all about spending time with family and enjoying all the delicious food & baked goodies. I wanted to share with you a delicious, simple appetizer recipe. 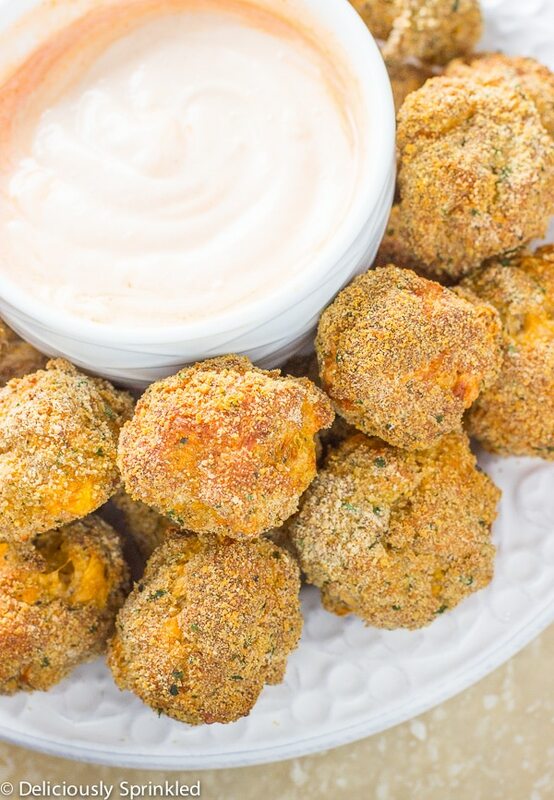 These Cheesy Sausage Bites are a mix between a cheddar biscuit and a sausage meatball with a crispy outside. To make them all you need is biscuit mix, ground sausage, cheese, hot sauce and to complete these delicious sausage bites, Pregresso™ Bread Crumbs. I love bread crumbs, I seriously add them to almost anything to give it that homemade taste without all the work. I hope you enjoy these Cheesy Sausage Bites as much as my family does especially during the holidays. ✓ PREGRSSO™ BREAD CRUMBS: I love Pregresso™ Bread Crumbs , I always have some in my cupboard. They add the perfect homemade taste to all my holiday favorites, like these Cheesy Sausage Bites. For this recipe, the Pregresso™ Bread Crumbs Italian Style but you could also use plain. ✓ DIPPING SAUCE: If you want to make a dipping sauce, here is what you will need. In a food processor combine: 1 cup mayo, 2 chipotle peppers, 2 tablespoons adobo sauce and 2 tablespoons lime juice. Blend until combined and smooth. 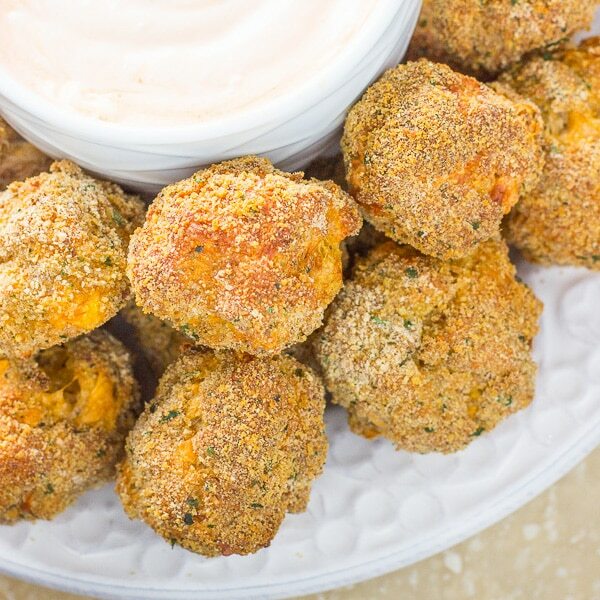 But honestly, these Cheesy Sausage Bites are excellent without the dipping sauce! 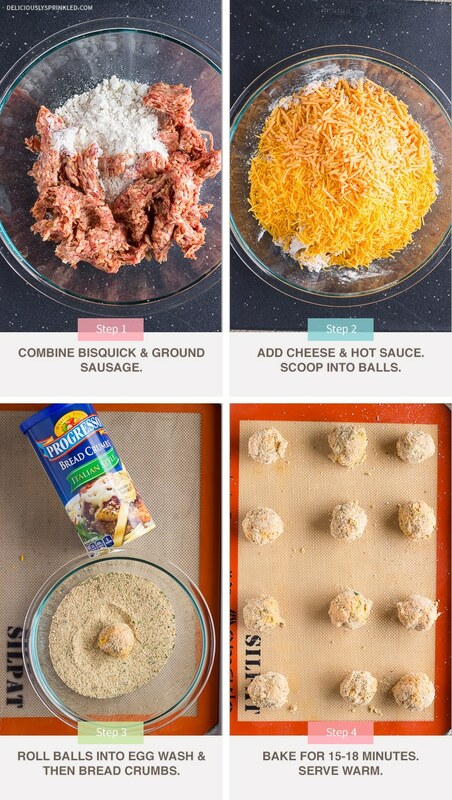 ✓ MAKE AHEAD & BAKE: You can make these Cheesy Sausage Bites the night before your party, just cover them and place them in the fridge. Or even better you can freeze them. I always have a bag in the freezer for a quick snack. I bake them frozen. I just add a couple of minutes to the cooking time so they can thaw in the oven. PRE-STEP: Preheat oven to 400F degrees. Line 2 baking sheets with parchment paper or silicone baking mats. Set aside. STEP 1: In a large bowl, combine Bisquick mix and sausage. STEP 2: Add cheese and hot sauce. Using a cooking scoop, scoop mixture into balls. STEP 3: In a small bowl, whisk the eggs together to make an egg wash. In another small bowl, pour bread crumbs. 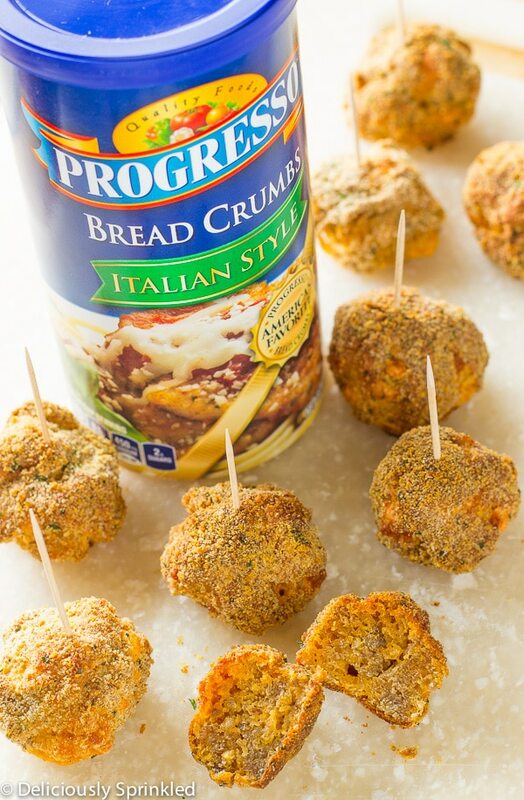 Dip each ball into egg wash and then roll into bread crumbs. Place balls onto prepared baking sheets. STEP 4: Bake for 15-20 minutes or until cookies through. Serve warm.